We are using cookies to make interactions with our website easier and improve our service, to better understand how our website is being used. Read more about cookies and available controls in our data privacy protection. ASSESS THE VALUE OF YOUR HOUSE OF APARTMENT. FREE OF CHARGE AND OBLIGATION. HERE! More details you can find in our data privacy protection. First party cookies help us to gather anonymized information for statistical purposes and to understand how users interact with the website. Third party cookies are data sets in text form, which are deposited when visiting a website in the browser or on the computer of the user. The intent is to show content that is relevant to each individual visitor. Once again, we were able to achieve top ratings at the “Capital” broker compass, and even scored best of all Berlin participants in two out of four sub-segments. “For three consecutive years, we have achieved the best rating, and this year we even received the highest score of all Berlin participants for our exposés and our team qualification. This is an award for the entire team and it confirms that we are on the right path,” summarizes managing partner Caren Rothmann. 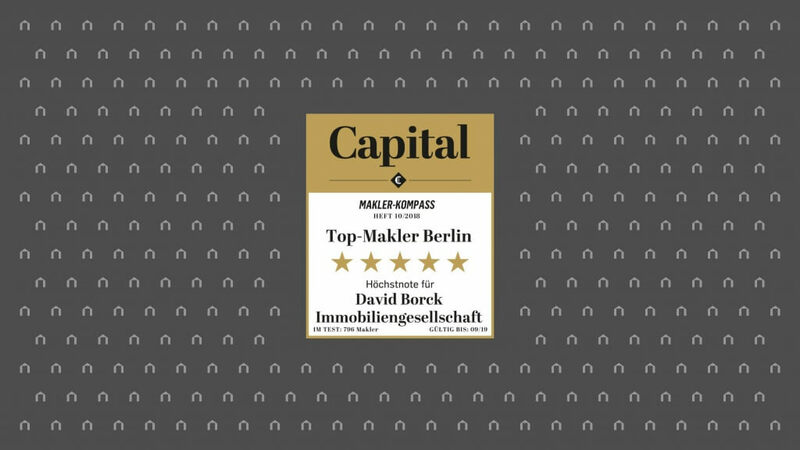 The Capital broker compass identifies the best real estate brokers in Germany with regard to their services in the sale of residential real estate. This year, a total of 796 real estate brokers from more than 10,000 agencies from all over Germany made it on the list, which covers the 50 most important German real estate markets from Aachen to Würzburg. Only about one in five of the 796 selected participants received the top five-star rating, among them the David Borck Immobiliengesellschaft. On behalf of the magazine Capital, the independent rating agency FERI EuroRating Services and the IIB Dr. Hettenbach Institute evaluated the categories qualification, process quality, exposé, contract and service. We are thrilled about this award and would like to thank our entire team for the consistent top performance. of the German Teleservices Act. In the context of usage of our websites personal data of yours will be processed by us as the entity responsible for data processing and be stored for the length of time necessary for the defined purposes and the fulfilment of statutory obligations. We shall be informing you in the following as to which data are affected hereby, the manner in which they are processed and the rights you have in this respect. According to Art. 4 No. 1 of the General Data Protection Regulation (GDPR) personal data refers to all information that refers to an identified or identifiable natural person. Our data protection officer may be contacted at the above address, attn. : Data Protection Officer or via datenschutz@david-borck.de. Should you have any questions pertaining to data protection laws or your rights as an affected person you may approach our data protection officer directly at any time. You may call up our websites without necessarily giving any details regarding your identity. The browser used on your terminal device merely automatically transmits information to the servers on our websites (e.g. browser type and version, date and time of access) in order to be able to establish a connection to the website. These also include the IP address of your inquiring terminal device. This is stored temporarily in a so-called log file and will be automatically deleted after four weeks. The processing of the IP address takes place for the technical and administrative purposes of the establishment and stability of the connection, of guaranteeing the security and functional capability of our websites and in order to be able, if necessary, to pursue any illegal attacks thereupon. The legal basis for the processing of the IP address is Art. 6 Para. 1 Clause 1 lit. f GDPR. Our legitimate interests derive from the aforementioned security interest and the necessity of a disturbance-free provision of our websites. We are not able to draw any immediate conclusions regarding your identity from the processing of the IP address and any other information contained in the log file. Inasmuch as you have explicitly granted your consent in accordance with Art. 6 Para. 1 Clause 1 lit. a GDPR we shall be using your e-mail address for the purpose of regularly sending you our newsletters. We differentiate thereby between our newsletter that supplies you with general information pertaining to the activities of our company (hereinafter: “Company Newsletter”) and the newsletter that informs you pertaining to specific real estate offers (hereinafter: “Exposé Offers). In the context of registration for a newsletter we also gather, in addition to your e-mail address, your first and last names as compulsory information in order to be able to send you personalised newsletters. De-registration is possible at any time, e.g. via a link at the end of every newsletter. Alternatively you are also welcome to communicate your wish to de-register to us at any time by sending an e-mail to service@david-borck.de. Your e-mail address will be deleted immediately after the revocation of your consent to the sending of the newsletter. We send our Company Newsletter through the service Newsletter2Go offered by the provider Newsletter2Go GmbH, Köpenicker Str. 126, D-10179 Berlin, Germany (“Newsletter2Go”). Newsletter2Go has been certified by TÜV Rhineland as a services provider with an audited system of data protection management. Newsletter2Go uses the information provided by you for the sending and evaluation of the newsletter on our behalf. We have concluded an order processing contract with Newsletter2Go. By means of Newsletter2Go we are able to measure and evaluate the conduct of the recipients of our newsletters. This involves the opening, click, bounce, delivery, de-registration, conversion and social sharing rates. This analysis is effected on the basis of Art. 6 Para. 1 Clause1 lit. f GDPR, in order to optimise our newsletters. A legitimate interest within the meaning of the aforementioned regulation is to be seen herein. We require your first and last names in order to know who the inquiry has come from. We require your e-mail Address in order to be able to reply to your inquiry. You may also supply your telephone number as a voluntary detail. The provision of your telephone number serves the purpose of making it easier to establish contact with you. This data processing is effected in the context of replying to the contact inquiry on the basis of our legitimate interest according to Art. 6 Para. 1 Clause 1 lit. f GDPR. – there is a legal obligation to forwarding in accordance with Art. 6 Para. 1 Clause 1 lit. c GDPR. Information is stored in the cookie that always arises in the context of the terminal device specifically deployed in the respective case. This does not mean, however, that your identity is made known to us in this way. The deployment of cookies serves the purpose of making the use of our offer more comfortable for you. For example, we use so-called session cookies in order to be able to tell that you have already visited individual sites on our website. Additionally, we also use temporary cookies in order to increase user friendliness, which are stored on your terminal device for a certain predefined period of time. Should you visit our site once again in order to avail yourself of our services, it is automatically established that you had already visited us and which entries and settings you had made at that time, so that it is not necessary to enter these again. Another reason why we deploy cookies is to statistically register the usage made of our website and in order to be able to assess the optimisation of our offer to you (cf. Figure 5). These cookies enable us to automatically establish that you had already visited us in the past in the event of a further visit. These cookies are deleted automatically after a predefined time set in the respective case has elapsed. The data processed by cookies are necessary for the named purposes in order to preserve our legitimate interests and those of third parties in accordance with Art. 6 Para. 1 Clause 1 lit. f GDPR. Most browsers accept cookies automatically. You may, however, configure your browser is such a way that no cookies are stored on your computer or that a warning always appears before a new cookie is created. The full deactivation of cookies may, however, result in your not being able to use all the functions of our website. The tracking and targeting measures listed in the following and deployed by us are implemented on the basis of Art. 6 Para. 1 Clause 1 lit. f GDPR. With the aid of the tracking measures used we wish on the one hand to ensure the needs-based designing and continuous optimisation of our website. On the other hand we use the tracking measures in order to statistically record the use of our website. We furthermore use the data for the optimised blending in of advertising. These interests are to be regarded as legitimate within the meaning of the aforementioned regulation. The other targeting measures listed in the following and deployed by us are implemented on the basis of Article 6 Para. 1 Clause 1 lit. f GDPR. The targeting serves the purpose of targeted advertising. We wish by way of the targeting measures deployed to ensure that only advertising oriented towards your interests is displayed on your terminal devices. The respective data processing purposes and data categories are to be gathered from the descriptions of the respective tracking tool. are transmitted to a server operated by Google in the USA and stored there. Google observes the data protection provisions of the “US Privacy Shield” and is registered with the US Privacy Shield programme of the US Ministry of Trade. We have furthermore concluded with Google an order processing contract for the usage of Google Analytics. Google gives its assurance by way of this contract that it will process the data in accordance with the provisions of the General Data Processing Regulation and guarantee the protection of the rights of the affected person. The information is used to analyse the usage of our website, compile reports on the website activities and perform other services connected with the usage of the website and of the internet for purposes of market research and the needs-based designing of this internet site. The information may also be transmitted to third parties, inasmuch as this is prescribed by law or third parties should process said data by order. Under no circumstances will your IP address be merged with other data possessed by Google. The ). You may prevent the installation of the cookies by an appropriate setting of your browser software. We do point out, however, that in this case you might not be able to use all functions of the website to their full extents. You may furthermore prevent the registration of the data generated by the cookie and which refer to your usage of the website (incl. your IP Address) and the processing of said data by Google by downloading and installing a browser add-on. As an alternative to the browser add-on, in particular in the case of browsers located on mobile terminal devices, you may also prevent registration by Google Analytics by clicking on this link. An opt-out cookie is then set that prevents the future registering of your data when visiting this website. The opt-out cookie applies only in this browser and only to our website and will be stored on your device. If you delete the cookies in this browser you must set the opt-out cookie once again. You may find further information pursuant to data protection in connection with Google Analytics in, for example, the Google Analytics Assistant. We use the Google service AdWords and, in this respect, conversion tracking, in order to measure the effectiveness of individual advertisements, offers and functions. To this end a cookie is set as soon as you click on a Google advertisement. This cookie does not serve the purpose of personal identification but is intended to make it possible to establish whether you, during the valid lifetime of the cookie, 30 days, re-visit the site with the specific offer. Every AdWords customer receives a different cookie. Cookies may thus not be traced via the website of AdWords customers. The information obtained with the aid of the conversion cookies serve the purpose of compiling conversion statistics for AdWords customers who have decided in favour of conversion tracking. We learn the total number of users who have clicked on an advertisement and been guided to a site furnished with a conversion tracking tag. You may permanently prevent the storage of the Google Conversion cookie by an appropriate setting of your browser software. The data protection declaration of Google on the matter of conversion tracking is to be found here. On our website information is registered and evaluated using cookies in order to optimise advertising pop-ups. For this purpose we use targeting technologies of Google Inc. (Double Click, Double Click Exchange Buyer, Double Click Bid Manager). These technologies enable us to approach you purposefully with individual, interest-related advertising. The cookies register, for example, those of our contents in which you have shown interest. On the basis of the information we are also able to display to you offers on the sites of third parties that are specifically oriented towards your interests as these may be deduced from your previous conduct as a user. The registration and evaluation of your conduct as a user is effected exclusively by pseudonym and does not enable us to identify you. The cookie will be automatically deleted after 30 days. You may also undertake settings for the display of interest-related advertisements using the advertising setting manager supplied by Google. Further information and the data protection provisions regarding advertising and Google can be found in the data protection declaration and conditions of usage of Google. The Tool Tag Manager itself (which implements the tags) is a cookie-free domain. The tool takes care of the dissolution of other tags which may possibly themselves register data. Google Tag Manager does not access these data. If deactivation has taken place at domain or cookie level this shall remain in existence for all tracking tags that have been implemented with the aid of Google Tag Manager. Further information pertaining to the Google Tag Manager may be found in the usage guidelines for this product. We use Bing Universal Event Tracking (UET) by Microsoft Bing Ads. This is a service offered by the Microsoft Corporation, One Microsoft Way, Redmond, WA 98052-6399, USA (hereinafter: “Microsoft”). This enables us to track the activities of users on our website should they have reached our website via advertisements from Bing Ads. If you reach our website via a Bing Ads advertisement a cookie will be set on your computer. A Bing UET-Tag is integrated on our website. This is a code by way of which, in conjunction with the cookie, some non-personal data concerning the usage of the website are stored. These include the length of the visit to the website, which areas of the website had been called upon and the advertisement via which the users had reached the website. Information regarding your identity is not registered. This information is transmitted to servers of Microsoft in the USA and stored there, as a basic rule, for a maximum of 180 days. Microsoft observes the data protection provisions of the “US-Privacy Shield” and is registered with the “US-Privacy Shield” programme of the US Ministry of Trade. We have also concluded with Microsoft an order processing contract for the use of Bing Ads. By way of this contract Microsoft gives its assurance that the data are processed in accordance with the General Data Protection Regulation and the protection of the rights of the affected person are guaranteed. More detailed information pertaining to the analyses services of Bing may be found on the Bing website. More specific information on the topic of data protection at Microsoft may be found in the data protection provisions of Microsoft. We use Facebook Website Custom Audiences of Facebook Ireland Limited (4 Grand Canal Square, Dublin 2, Ireland). This is a marketing service offered by Facebook. This enables us to cause individually coordinated and interest-related advertising on Facebook to be displayed to certain groups of pseudonymised visitors to our websites who also use Facebook. A Facebook Custom Audience Pixel Tag is integrated within our website. This is a Java Script code by means of which non-personal data pertaining to the usage of the website are stored. These include your IP address, the browser used and the departure and target sites. This information is transmitted to servers of Facebook in the USA. Facebook is subject to the EU-US Privacy Shield, so that an appropriate level of data protection is guaranteed. Here an automated comparison takes place whether you have saved a Facebook cookie. It is automatically established via said Facebook cookie whether you belong to the target group relevant to us. If you should belong to the target group our appropriate advertisements will be displayed to you on Facebook. During this procedure you will not be personally identified as a result of the comparison of the data, neither by ourselves nor by Facebook. You may object to the use of the service Custom Audience on the website of Facebook. After logging into your Facebook account you will reach the settings for Facebook advertising pop-ups. You may find more detailed information on data protection at Facebook in the data protection guideline of Facebook. We use so-called Web Fonts that are provided by Adobe Typekit, a service of Adobe Systems Inc., 345 Park Avenue, San Jose, CA 95110-2704. When you call up our website your browser loads the required web fonts into your browser cache in order to be able to display typefaces correctly. For this purpose the browser you use must establish connections to the servers of Adobe Typekit. Your IP address will thus be transmitted to Adobe in the USA. You may find more detailed information in the data protection pointers of Typekit, which you may call up here. We use Adobe Typekit on the basis of Art. 6 Para. 1 Clause 1 lit. f GDPR, in order to be able to present our website appropriately. A legitimate interest within the meaning of the aforementioned regulation is to be seen herein. – To complain in accordance with Art. 77 GDPR to a supervisory authority. As a general rule you may address yourself for this purpose to the supervisory authority responsible for your normal place of residence, the place at which your workplace is located or the head office of our company. Inasmuch as your personal data are processed on the basis of legitimate interests according to Art. 6 Para. 1 Clause 1 lit. f GDPR you have the right to lodge an objection to the processing of your personal data in accordance with Art. 21 GDPR inasmuch as grounds are given for this that derive from your own particular situation or the objection is aimed against direct advertising. In the latter case you possess a general right of objection that will be realised by us without the need to invoke a particular situation. Should you wish to exercise your right of objection an e-mail to service@david-borck.de shall be sufficient. All personal data submitted by you will be transmitted in encrypted form using the commonly accepted and safe standard TLS (Transport Layer Security). TLS is a safe and tried and tested standard that is, for example, also used in online banking. You may recognise a safe TLS connection, inter alia, by the “s” suffixed to http (i.e. https://..) in the address bar of your browser or by the lock symbol in the lower area of your browser. We otherwise use suitable technical and organisational security measures in order to protect your data against accidental or intentional manipulation, partial or complete loss, destruction or the unauthorised access of third parties. Our security measures are being continuously improved in accordance with technological developments. This data protection information is currently valid and up-to-date as of May 2018. These Terms of Contract and of Use govern the use of the online offer of David Borck Immobiliengesellschaft mbH,Schlüterstr. 45 10707 Berlin (hereinafter: Broker) under the domain name www.david-borck.de (hereinafter: Website) and the contractual relationship between the Broker and its customers. (1) The offers on the Website and in the synopses are based on the data and information received from the owner or other third parties and are not checked by the Broker. The offers are without obligation and non-binding. (2) All rights to the contents of the Website and the synopses are vested in the Broker unless otherwise stipulated. The customer is prohibited from copying, disseminating and/or publishing copyrighted contents outside of the legal limits of Art. 44a et seq. Copyright Law. This prohibition exists irrespective of the form in which the contents is copied, disseminated and/or published and also refers explicitly to the inclusion of copyrighted contents for direct access (so-called embedded content). (1) For proof of the possibility of closing a sales or lease agreement or for negotiating such a contract, the customer undertakes to pay a commission to the Broker. For sales agreements, the commission is 7.14% of the sales price, for lease agreements, 2.38 times the net basic rent (both including VAT). The retail price is the negotiated purchase price plus the value if applicable reducing the purchase price of accepted loads (real property). Otherwise, the commission is shown in the synopsis made available by the Broker. (2) Contrary to the provisions of Paragraph 1, the Customer is not obligated to pay a commission if seeking an apartment for which they have received proof of the opportunity to conclude lease agreements for residential premises or have had such agreements mediated, unless the Agent is exclusively tasked by the lessor or other authorised party with offering the apartment to the Customer under the terms of the agency agreement. (1) The customer undertakes not to exploit any of the offers, information or synopses transmitted by the Broker or disclose or provide it to third parties without the Broker’s prior written consent. (2) For every proven violation against the obligation in Art. 4 (1) of these General Terms of Contract and of Use, the customer pays a contractual penalty to the Broker in the amount of the lost commission according to Art. 3 (1) of these General Terms of Contract and of Use on concluded sales or principal agreements if subsequently a sales or principal agreement is concluded between the third party and the owner without involving the Broker. To calculate commission, Clause Art. 3 (1) of these Terms applies accordingly. (3) The above prohibition against disclosure also applies beyond the end of the contractual relationship. The customer assures that the data provided by him is relevant and complete. The Broker is entitled to work for both the owner as well as the customer. (1) The Broker is not liable for the accuracy and completeness of the offers listed on the Website or in the synopsis. If third party contents (videos, pictures), which is marked as such, is embedded in the Website or in the synopsis, the Broker assumes no responsibility for the accuracy and/or legality of these contents. Independent of this, the Broker is liable for the diligent and expert provision of its contractual services as well as for their faultlessness. (2) Unlimited liability: The Broker is liable in the case of intent and gross negligence. For slight negligence, the Broker is liable for damages arising from injury to life, limb and health of persons. if an essential contractual duty has been violated whose fulfilment is a pre-requisite for being able to execute the contract properly in the first place and on whose fulfilment the customer may normally trust (cardinal obligation), and the liability is limited in amount to the foreseeable damage typical for the contract at the conclusion of contract. (4) This limitation of liability also applies to the Broker’s vicarious agents. (1) Should these Terms of Contract and of Use contain invalid provisions, the validity of the remaining provisions remains unaffected. (2) Exclusively German law is applicable to the present Terms under exclusion of the UN Convention on Contracts for the International Sale of Goods (CISG). (3) Should the customer be a business owner, a legal entity under public law or special fund under public law, then Berlin is the legal venue for all disputes arising from or in connection with these Terms.